Dance your way into the weekend with five ball options to choose from! There are plenty of events, so take your pick! It's officially the month of love, and the events are starting to reflect that! Use this compiled list as your guide to planning something fun for this weekend! Here’s your DMV weekend roundup for Friday, February 8, through Sunday, February 10. Come on down to the Assembly Room to support the Ulman Foundation's mission. Come wearing your jeans and a bow tie because this isn't your typical ball. Come and enjoy exclusive food and drinks, a dinner program, and live auction before the Blue Jeans Ball opens for general admission guests. For more information, check out the event here! This is a great way to shake off the winter blues and drink with other craft lovers. Sample new craft beers, shop at the local shops for your Valentine, and participate in a raffle. The vendors will include categories like fiber arts, jewelry, paper goods, painting, woodwork, soaps and body care, cookies, and much, much more! Admission is free, but make sure to register for the event here! For more information, check out the event's website! Come on out to The Belmont for an interactive hour of fun -- who will be the best lip syncer? Happy hour will include both drinks and food ($6 chicken and fish dinner and $6 cocktails). Admission is free, and the event will run from 6 to 9 p.m. For more information, check out the event here! Come see the beautifully entertaining work of The Music Man. This Broadway musical is a tale about a con artist salesman who tricks people into purchasing instruments for a boys' band he's not really organizing. His devious plan falls apart when he falls for the local librarian. Tickets are selling for $69–$249, and the show is set for 8 p.m. For more information, check out the event here! Join other beer lovers for a special edition bar crawl event. Whether you are single or taken, join D.C.'s finest for some delicious cheap beer and food deals. You get a signature Cupid’s refillable mug, party favors, exclusive drink and food specials, a raffle entry to win great prizes, and free pictures with the purchase of a ticket ($25 each). For more information, check out the event here! Come see the traditional African stylings of the Acapella group Ladysmith Black Mambazo live and in concert. Their deep and smooth harmonies granted them South Africa’s cultural ambassadors to the world in their native country by Nelson Mandela. Ladysmith Black Mambazo spreads a message of peace, hope, and love at every concert through melody and dance with an infectious sense of joy. Tickets are selling between $29 and $69. For more information, check out the event here! Enjoy the spectacular show that is the D.C. Chinese New Year Parade! Watch Kung Fu demonstrations and traditional lion and dragon dances! Find out more here. Join fellow Yoga fans for an early morning class in the National Building Museum. The class will be a mellow, all-level course under the 75-foot-tall Corinthian columns in the Great Hall. They are asking that you purchase your tickets ahead of time and to bring your own mat. For more information, check out the event here! Enjoy a nice evening of dancing while supporting two great causes! All are welcome to attend the gala, which is sponsored by the District of Columbia Society of the Sons of the American Revolution. The charities that will be supported both evenings are the Disabled American Veterans and Terre Fraternité. For more information, check out the event here! Instead of selling tickets, they are accepting donations. Head on down to the Sequoia for a magical evening of intrigue, mystery, and fantasy. 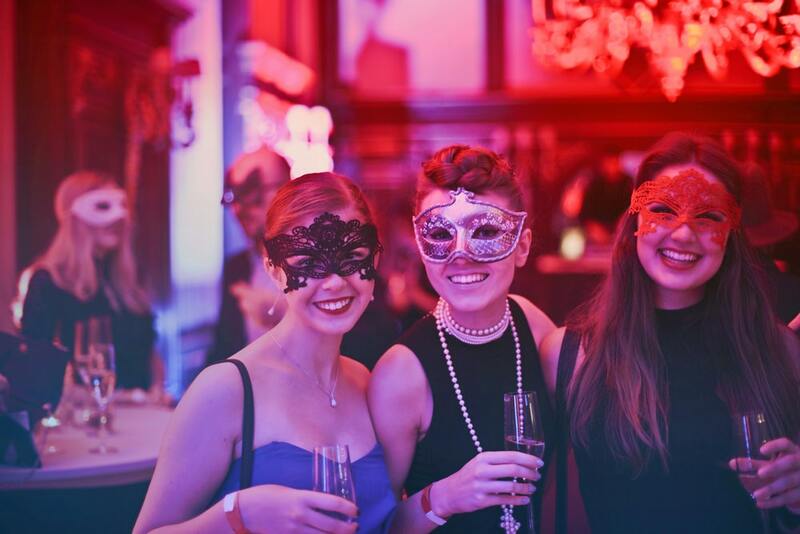 When you arrive, pick the mask of your choice to wear for the evening, and wear it well. Dance with some amazing people and possibly get hit with Cupid's arrow. The evening will feature fun activities such as a James Bond-themed scavenger hunt and a full course champagne dinner. Tickets cost up to $1,400. For more information, check out the event here! Go see the intimate one-act play that tells the story of Aggy and her experience of loss, uncertainty, and hope. The play will be held in the historic interior of the Wilton museum, and the tickets are selling for the affordable price of $20 each. For more information and to purchase tickets, check out the event here! Dance the night away at the Military Aviation Museum with a live band playing the old-time tunes. The night will feature live music, silent auctions, a costume contest, and a new VIP Dinner experience. For more information check out the event here! A Bingo Night for the whole family that features some groovy Disco tunes. The Bingo Night will include a chance to win fun prizes, enjoy dinner and other goodies, and play to win the $250 grand prize! A delicious Italian dinner will be served. For more information, check out the event here! Kids will make crafts, play games, cuddle with the animals, and give handmade Valentines to the SPCA’s shelter residents. Who knows? You may just find your purr-fect pal! All proceeds go back to helping shelter animals at the VBSPCA — admission is $20 per person. For more information on this event, check it out here. Come and see the Virginia Symphony Orchestra from 6:30–10 p.m. as they bring Harry Potter to life on stage. Enjoy the musical stylings of John Williams with scenes from the movies playing on the backdrop! This show is for wizards, witches, and muggles of all ages. Be sure to dress in your finest robes and get there early for photos, trivia, and prizes! Tickets start at just $25 -- get them here! For more information, check out the event here! Come enjoy the cultural stylings of Step Afrika! Their performances integrate songs, storytelling, humor, and some audience participation. Tickets are between $25 and $65. Check out the event and purchase tickets here. Bring your Valentine for the production of Til Death Do Us Part by Stage Coach Theatre. You and your Valentine will play detective through two acts, a three-course lunch, and a bottle of wine. Tickets are selling between $190 and $525 -- get them here! For more information, check out the event here!